Habitat: Originally, parsley was probably endemic to Southwest Asia and the Mediterranean (Turkey, Algeria, Sardinia, and Lebanon). The herb has been cultivated since ancient times and was early on widely grown in most parts of Europe. Today, the plant is extensively used as a spice and cultivated all over the world. Description: Parsley is a biennial plant belonging to the Apiaceae family (the celery, carrot or parsley family). 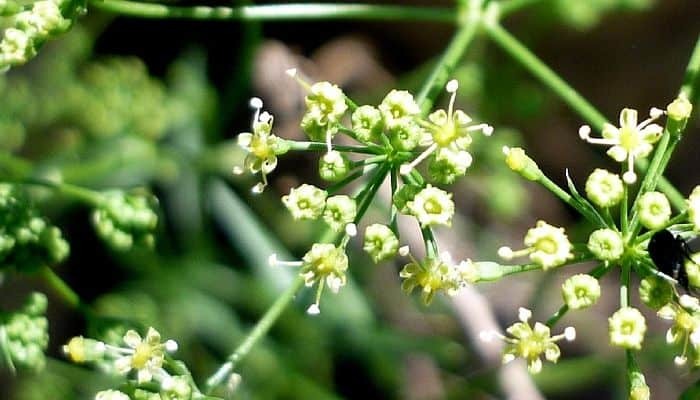 Parsley is easy to grow, and even though it is a biannual, it is usually grown as an annual because in its second year it uses all its energy to form stems, flowers and seeds, leaving the leaves small and bitter and not very suitable for consumption. Parsley can grow up to 30 to 60 cm in height. The tripinnate leaves are curly and shiny and sit on bare stalks. The yellowish-green flowers appear on long hollow stalks. The seeds that follow after flowering are small and round shaped. 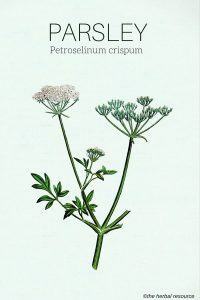 The taproot is sweet and fleshy and not unlike wild carrot. Plant Parts Used: The whole plant is utilized either as medicine or food. The leaves are used fresh or dried as a seasoning and garnish while the root and seeds are primarily used as herbal medicine. An essential oil is produced by steam distillation usually from the mature seeds but it is also possible to extract essential oil from the leaves and root. The oil is colorless or yellow or brown-green with a rather strong and spicy flavor. The parsley leaves are best during the plant’s first year and they can be picked at any time during the growing season. The leaves can be dried or kept frozen for later use. The root is collected in the autumn in the first year or in the spring of the second year of the plant’s life cycle. It should be used fresh, but can also be stored as other root vegetables, preferably in a cold place. The seeds are collected in the fall of the plant’s second year. The essential oil has a high content of apiol (phenylpropanoid ), myristicin, apiolin, pinene and other substances. The medicinal properties of parsley are largely due the substances apiol and myristicin. In many countries in Europe, parsley was considered a “devil’s herb” and if planted on the Good Friday it was thought to bring misfortune to those who cultivated it. Because parsley seeds germinate late, it was believed that the seeds had to travel nine times back and forth to hell before they could sprout. In ancient Greece, the herb was dedicated to Persephone, the daughter of Zeus and the queen of the underworld and for centuries Greek soldiers believed that any contact with parsley before a battle signaled impending death. Because of the herb’s association with death, it was often planted on Greek graves to bring happiness to the deceased. In ancient Rome, the plant was attributed with magical powers and it was believed that by eating the seeds one could become invisible and get supernatural strength. Parsley was probably not used extensively as medicine in ancient times but there exist some historical mentions of it as a medicinal herb. The Roman physician Galen (130 AD – 200 AD) prescribed it for “falling sickness” (epilepsy) and as a diuretic in the case of edema and Pedanius Dioscorides (40 – 90 AD), a Greek physician and botanist, describes the herb as a diuretic and as a remedy for irregular menstruation. The German writer, composer and philosopher Hildegard of Bingen (1098 – 17 September 1179) recommended compresses of parsley to treat arthritis and that the herb should be cooked in wine against chest pain. Over the centuries the herb has been used traditionally to treat various ailment and diseases. Externally, the herb was used to treat insect bites, injuries and get rid of lice, and internally as a treatment for dysentery, gallstones, and jaundice. 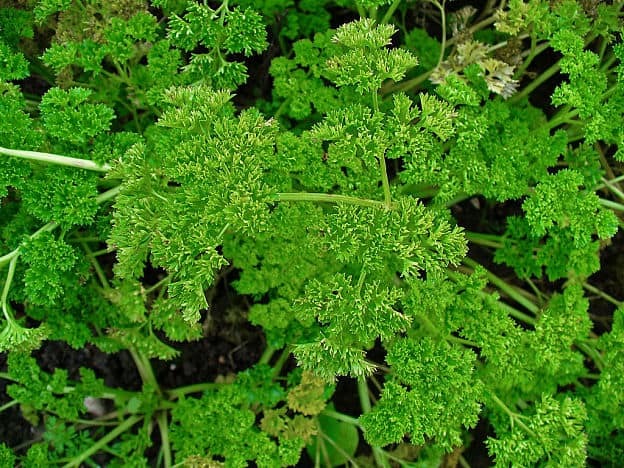 Parsley seeds were even used as a remedy against the plague and once it was used as a replacement for quinine to treat malaria. 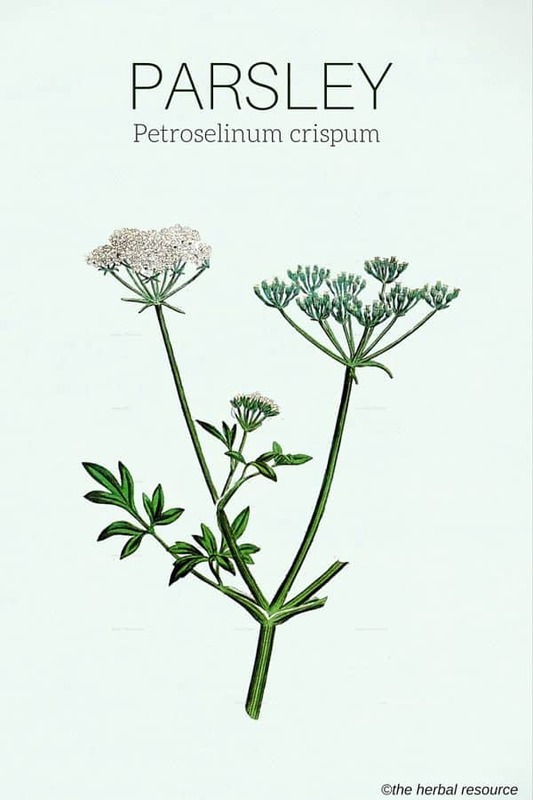 In the 1800s and 1900s, parsley was listed in Pharmacopoeias as a laxative and as a diuretic agent that could be used as a treatment for kidney problems and edema caused by heart failure. Parsley is rich in minerals such as iron, magnesium, calcium, potassium, zinc, and phosphorus. It also contains high levels of folic acid (B vitamin) and the vitamins A, B, C, and K.
Studies have shown that vitamin K is vital in bone formation, protects against osteoporosis and is very beneficial for the circulatory system and the nervous system. Five grams of parsley usually covers the daily requirement of vitamin A, and 25 grams of the fresh herb cover the daily requirement of vitamin C.
Parsley is an excellent source of dietary fiber but also calcium which makes it a good chose for those who are not very keen on consuming dairy products. 100 g of the fresh herb gives 36 kg calories, mostly in the form of carbohydrates, with 3.6 g of fiber. The furanocoumarins found in the leaves have antimicrobial properties and the high content of antioxidants, vitamin C and carotenoids makes the herb helpful in strengthening the immune system and build up resistance against infections and diseases. Some studies have suggested that parsley may limit the harmful effects of some known carcinogenic substances. This is probably due to the chlorophyll content of the herb, but other substances, such as vitamin C, flavonoids and carotenoids may also play a part. Additionally, it has been found that the substances myristiecin, limonene, eugenol and alfathujen present in the essential oil of parsley have an anti-cancer effect. As the fresh herb is high in iron and that its content of vitamin C increases the iron uptake, it can be useful in the treatment of anemia (anemia). The herb also contains the much needed folic acid, a vital building block of the red blood cells. Parsley increases the secretion of digestive fluids which may lead to better digestion, improved nutrient uptake, and less intestinal gas production. 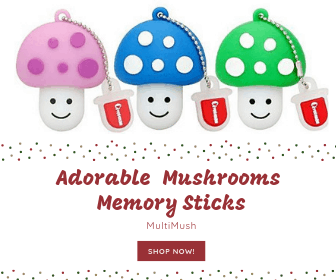 It may also be used as a remedy for colic and other digestive problems. Chewing on parsley to get rid of garlic breath is a well-known household remedy. While studies have not been able to prove that parsley is effective in this regard it may at least have some effect due to the high chlorophyll levels found in the herb. Chlorophyll is a compound known to have anti-bacterial properties so to use parsley to get rid of bad breath might be worth a try. Parsley has diuretic properties and has been used to treat fluid retention (edema or dropsy) and to speed up the elimination of harmful toxins from the digestive system. Medical doctors often prescribe diuretics as a treatment of high blood pressure, and German doctors, who are known to use medicinal herbs to great extent, often recommend a tea made from the seeds as a treatment for high blood pressure. It should be kept in mind that high blood pressure may cause serious health problems so any use of parsley as medicine should be done in consultation with a professional health care worker. A study published in the Journal of Allergy and Clinical Immunology showed that parsley inhibits the secretion of histamine, a substance produced in the body that is responsible for triggering allergy symptoms. The herb may therefore be helpful as a herbal remedy for hay fever. Animal studies have shown that the herb reduces blood glucose levels which indicate that it could be used as a natural treatment for diabetes. As a Tea: Two teaspoons of the dried leaves or the root, or one teaspoon of the crushed seeds in a cup of boiling water. Soaked for 10 minutes and then strained. The usual recommendation is up to three cups daily. As a Tincture: The therapeutic dose is around 10 to 30 drops of the tincture made from the seeds taken four times daily. Commercial Products: When using commercial products containing parsley, the instructions on the packages should be followed. The recommended daily intake of the dried parsley leaves or is usually around 6g. No health risks have been linked to parsley when it is used for culinary purposes. Children may consume the herb in small amounts but any medicinal preparations of it should be avoided. The seeds and essential oil are toxic in large doses so any medical use of them should be done with caution and only under the guidance of a trained herbalist or an expert health care professional. The seeds and essential oil should not be used by pregnant women, children, and people with kidney problems. Over-consumption of the seeds can lead to irritated stomach, liver, heart, and kidneys. Herbal tea made from the seeds should not be drunk for more than two weeks. No interactions between parsley and other medications are known. People with known allergy or hypersensitivity to plants in the Apiaceae family (the celery, carrot or parsley family) should avoid parsley. Kreydiyyeh Si, Usta J.: Diuretic effect and mechanism of action of parsley. J Ethnopharmacol. 2002.